The role of blood vessels in tumor progression has been investigated for more than a century. The requirement of a blood supply in order to sustain tumor development and its capacity to spread to distant organs is a critical feature of cancer. However, tumor vasculature is generally known to be unevenly distributed and chaotic, leading to blood flow through tumors that do not follow a constant, unidirectional path. This creates zones of ischemia and ultimately necrosis as tumors outgrow their blood supply. Besides providing oxygen and nutrients, the vasculature plays a critical role in the inflammatory process. To infiltrate inflamed tissues, including tumors, immune cells have to interact with the blood vessel wall. These interactions start with immune cells becoming tethered to and then slowly rolling along the vascular wall. This may result in firm adhesion with subsequent activation of the immune cells, followed by their diapedesis　and emigration into the surrounding tissue. In lymphoid organs　for instance, immune cell adherence and transendothelial migration occur at specialized postcapillary vascular sites called high endothelial venules (HEVs). These sites are rich in adhesion molecules as well as in T cell chemokines, which help to mediate immune cell trafficking. So far, more than 40 molecules have been identified to play a critical role in angiogenesis　but most studies to date have focused on vascular endothelial growth factor (VEGF) and its receptors. In fact, since 2004, ten drugs that target VEGF or its receptors have been approved for the treatment of various malignant diseases, with many more in clinical trials. Unfortunately, these agents have provided very modest survival benefits in some tumor types and have had no efficacy in others. The underlying mechanisms for these inconsistencies of antiangiogenic therapy responses are the subject of intense research, which will hopefully result in more efficient therapeutic interventions. Nevertheless, numerous studies demonstrate that escape mechanisms from antiangiogenic interventions can be modulated by immune cells, which provide a critical source of chemical factors that promote neovascularization, immunosuppression, and other cancer hallmarks. A dysfunctional vasculature, such as the one found in many solid tumors, not only impairs supply of tumors with oxygen and nutrients, but it also prevents the influx of tumor-reactive T cells thereby fostering an immunosuppressive microenvironment, which in turn allows tumors to escape from host immunosurveillance. Tumor vascular endothelium has been shown to express several inhibitory molecules that can limit the antitumor immune response, such as the inhibitory checkpoints Programmed cell death ligand 1 (PD-L1) and PD-L2. In fact, there is mounting evidence that sustained angiogenesis as well as immunosuppression are interconnected processes facilitated by regulators that are operative under both cancerous and normal, physiological conditions. There is a growing list of immune cell types that, when appropriately activated, can promote both immunosuppression and angiogenesis. A recent study described an involvement of phosphatidylinositol 3-kinase (PI3K) activation in myeloid cells　in resistance to antiangiogenic therapy and, more recently, two papers showed that inhibition of a myeloid-specific isoform of PI3K (PI3K gamma) switched the activation state of myeloid cells from an immunosuppressive to a pro-inflammatory phenotype, sensitizing tumors to immune checkpoint blockade (ICB). ICB therapies, such as the ones targeting cytotoxic T lymphocyte-associated antigen-4 (CTLA-4) or programmed cell death protein 1 (PD-1), have displayed durable clinical responses in various cancers and are now approved by the FDA for a growing list of cancer types. Although these new immunotherapies have had a notable effect on cancer treatment, multiple mechanisms of immune resistance exist. Recent efforts have focused on combining this immunotherapy approach with other therapies to maximize its potential. Tumors considered immunologically “cold”, with reduced or even absent infiltration of T cells, are a major hurdle in the cancer immunotherapy field, and strategies to overcome this resistance mechanism are urgently needed. In a recent study, Elizabeth Allen and collaborators sought to investigate additional immune-related mechanisms of resistance to antiangiogenic therapy and described the effects of combining the inhibition of angiogenesis and ICB. The authors made use of three mouse tumor models which are all resistant to antiangiogenic therapy: a pancreatic neuroendocrine tumor model, a mammary carcinoma model, and a glioblastoma (GBM) model. Their findings demonstrate a substantial increase of immunosuppressive PD-L1 expression in different cell types after antiangiogenic therapy, particularly in pancreatic and breast cancer models. The authors show that up-regulation of PD-L1 expression was due to enhanced secretion of the inflammatory cytokine Interferon gamma (IFNy), a known inducer of PD-L1 expression, during antiangiogenic therapy. The authors further examined the combination of VEGF/VEGFR inhibitors with anti-PD-L1 therapy and found notable responses in terms of reduced tumor burden and prolonged survival in pancreatic and breast cancer models, but anti-PD-L1 therapy was insufficient to sensitize GBM to antiangiogenic therapy. The combination treatment facilitated the infiltration of T cells and dendritic cells in pancreatic and breast tumors, but not in therapy-resistant GBMs. It is important to note that a number of clinical trials are now evaluating similar combinatorial approaches of VEGF/VEGFR and PD-1/PD-L1 inhibition for a number of cancer types such as renal cell carcinoma, colorectal cancer, ovarian cancer, and recurrent glioblastoma (NCT03024437, NCT02659384, NCT02873962, NCT02017717), with hopefully promising results for cancer patients as well. 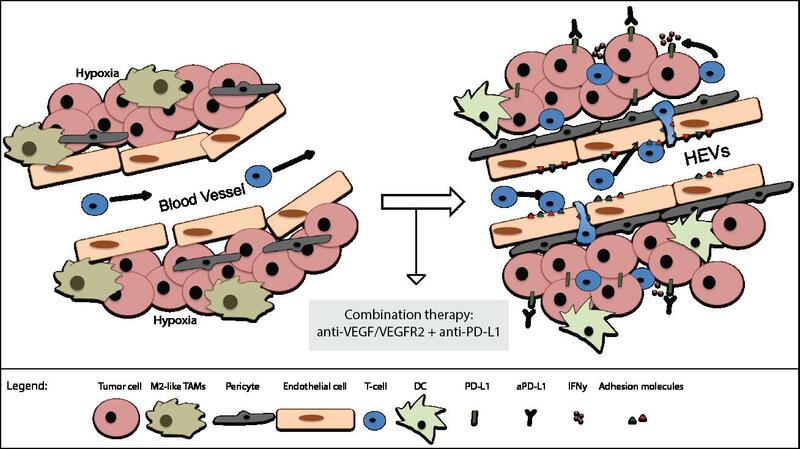 Based on the premise that the synergistic effect of antiangiogenic/anti-PD-L1 therapies is immune-dependent, the authors decided to investigate in more detail if alterations of the tumor vasculature and consequently immune cell trafficking could be responsible for the distinct outcomes of antiangiogenic/immunotherapy in the different tumor models. Interestingly, combination therapy stimulated blood vessel normalization, characterized by reduced vessel density and increased pericyte　coverage, in all three tumor types, but less prominently in GBMs. Most importantly, and possibly their major finding, the authors demonstrate that morphological changes resembling features of HEVs occur in several areas of the tumor vasculature of pancreatic and breast tumors, but not in the resistant GBMs, during combination therapy. Taken together, these findings suggest that the beneficial effects of the combination therapy are likely dependent on intratumoral HEV formation, which consequently facilitates T cell trafficking (Figure 1). 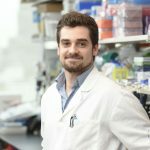 Further studies aimed at understanding the biology behind the formation of intratumoral HEVs as well as the therapeutic potential of molecules that induce HEVs, such as lymphotoxins, are needed, and will certainly enable the development of novel treatment options for cancer patients. In a similar study published by Martina Schmittnaegel and collaborators it is shown that blockade of the proangiogenic cytokines VEGF and ANGPT2　promoted vascular normalization, tumor necrosis, and facilitated the infiltration of activated T cells in different tumor models. Concurrent blockade of PD-1 enhanced the antitumor immune response. Similarly, their findings position immune cells as key effectors of antiangiogenic therapy and support the rationale for combinatorial approaches with immunotherapy. Figure 1. Illustration of proposed mechanisms for combination therapy with antiangiogenics and ICB. Left: tumor with abnormal vessels, characterized by a defective structure, poor pericyte coverage, areas of hypoxia and impaired T cell infiltration. Right: tumor after antiangiogenic therapy with a normalized vasculature, enhanced pericyte coverage, expression of adhesion molecules and increased T cell infiltration. The formation of HEVs leads to more efficient T cell influx into tumors. IFNy-mediated expression of immune inhibitory checkpoint molecules, such as PD-L1, can be counteracted by the use of ICB promoting more efficient tumor control (Image credit: adapted from Campesato LF & Merghoub T, 2017). In summary, overcoming immunotherapy resistance is a major focus of research in the scientific community and the identification of mechanisms that facilitate blood vessel normalization and enhanced T cell trafficking has important implications for the design of more effective combinatorial strategies. Moreover, understanding what makes certain tumors, such as GBMs, intrinsically more resistant to the formation of HEVs and antiangiogenic/immunotherapy combination is a promising avenue of research. Successful immunotherapy must offer rational combinatorial strategies that take into consideration tumor features in a personalized manner, in order to effectively overcome resistance mechanisms. Switching “cold” into “hot” tumors, based on tumor T cell infiltration and inflammatory gene expression signature, is an attractive modality in that sense, given the requirement of T cell infiltration in different therapeutic modalities for efficient eradication of tumor cells. These recent findings move forward in that direction and introduce opportunities for exploring therapies targeting the tumor vasculature to enhance T cell trafficking and to sensitize tumors which are resistant to ICB.